AKIPRESS.COM - An earthquake measuring 5.3 on the Richter scale has struck central Italy, forcing people to flee their homes, Independent reports. 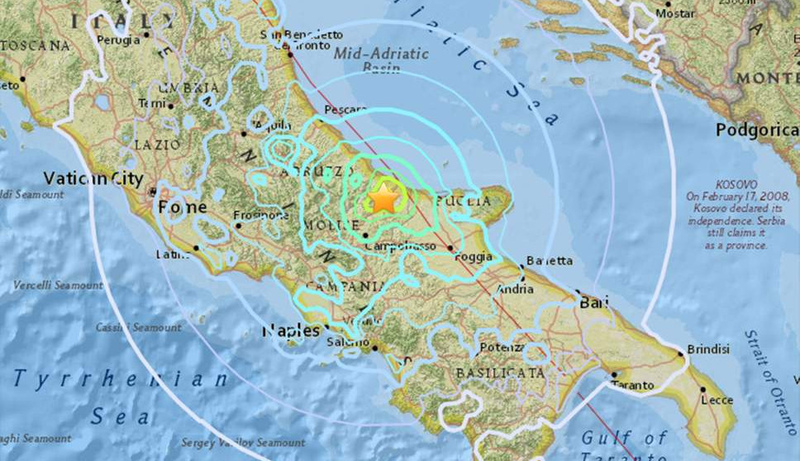 The quake hit near the Adriatic coast, at a depth of around seven miles, the US Geological Survey said. The mayor of Montecilfone, the city near the epicentre of the quake, said people were scared but there was only minor damage. "Some old walls that were already in bad shape have collapsed, but there's no major damage," Franco Pallotta said on SkyTG24. "People are alarmed. Thank God, I have no news of injuries." The fire department confirmed that there had been no rescue calls from the area near the epicentre, noting that only slight damage to some buildings had been spotted. The Molise region's governor also said that only minor damage had been reported.